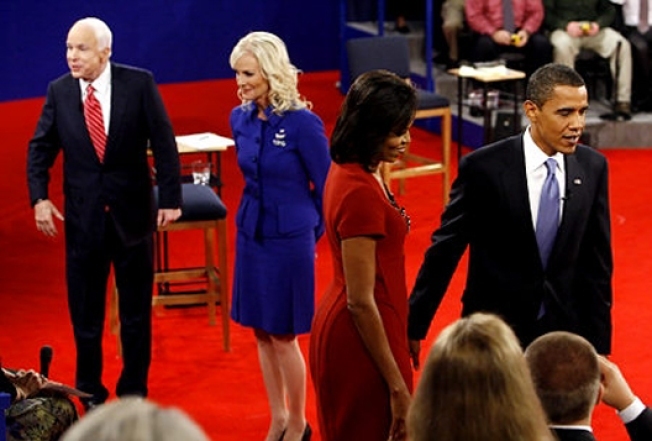 While pundits and journalists weigh in on how Barack Obama and John McCain did in last night's debate, some bloggers have been discussing other aspects of the event—like which candidate's wife had the best look. Mrs. O gives it to Michelle, of course, writing: "Mrs. O was channeling style with a twist last night in Tennessee, as she wore a classic red shift dress, with witty additions from the front diamante bows, to the exposed metallic zip at the back." NashVogue, on the other hand, thinks Cindy was victorious: "Cindy’s suit was a classic blue suit. The color is very in style this season. The cut was classic and very appropriate for a potential first lady. The cut flattered her body type." Important points all, but what about their hair? Did Cindy finally get those extentions she wanted? These are the important questions.